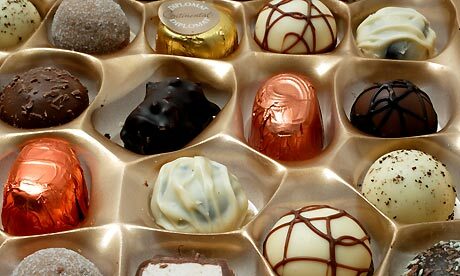 Last night we shared a bottle of Bordeaux wine and I DIDN’T REALLY share a box of Thornton’s chocs from the UK. Look – I’d had a tough day at the cutting edge of passion OK! Come and get me gravity. It was a sin but all things are relative. Tomorrow I’m gonna get out the bike and ride it off. I promise. This entry was posted in Cycling, Emma Calin, Food, Romance Writing by emmacalin. Bookmark the permalink.